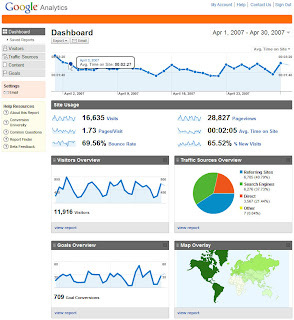 Google Analytics Solutions: New Version of Google Analytics! New Version of Google Analytics! in San Francisco, Brett Crosby and Jeff Veen unveiled the new version of Google Analytics. We will be activating this new version on all current Analytics accounts over the next few weeks, so please be on the lookout for an email from us and keep an eye on your settings page. Why did we develop this new version? Since Google Analytics launched in November 2005, the demand for website analytics has increased significantly. Today there are hundreds of thousands of Google Analytics customers, and web analytics has moved from being a niche function to becoming a mainstream aspect of the business for companies of all sizes. You've asked that we focus our engineering efforts around maintaining the sophistication and features that experienced users want, while also making it easy for both experts and non-experts to quickly and easily find the answers you want. And as always, the Help Center, the Google Analytics Authorized Consultant program and the Analytics Help Forum are available to help you. Today at the Emetrics Summit in San Francisco, Brett Crosby and Jeff Veen unveiled the new version of Google Analytics. We will be activating this new version on all current Analytics accounts over the next few weeks, so please be on the lookout for an email from us and keep an eye on your settings page.